Dr. Nicholas Agnesi is one of the most experienced physicians in the treatment of hair loss, whether male pattern baldness, female pattern baldness, or burned-out scarring alopecia such as pseudopelade, or alopecia areata. 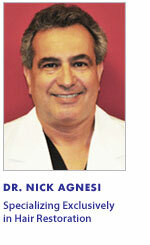 Dr. Agnesi, the founder and medical director of AHR Hair Restoration, is one of the leading hair transplant surgeons to offer natural results using innovative techniques in hair transplant surgery. After meeting with patients, Dr. Agnesi focuses on their individual needs and helps each one to achieve his or her specific goals. Dr. Agnesi utilizes hair transplant surgery, medical treatments such as Propecia or Rogaine (minoxidil), low level laser therapy, as well as other means of hair restoration. 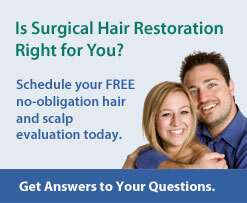 At AHR Hair Restoration, we realize that every hair transplant candidate has unique needs and desires. Therefore, each individual hair restoration patient's treatment plan is customized to their specific situation, including age, hair type, general health, degree of hair loss, lifestyle, and overall expectations.